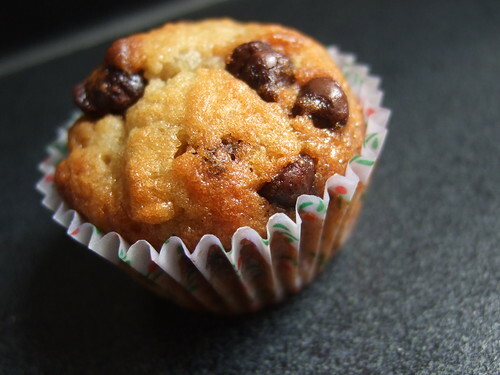 Moist Banana Chocolate Chip Muffins Recipe. 1. Preheat oven to 350°F. 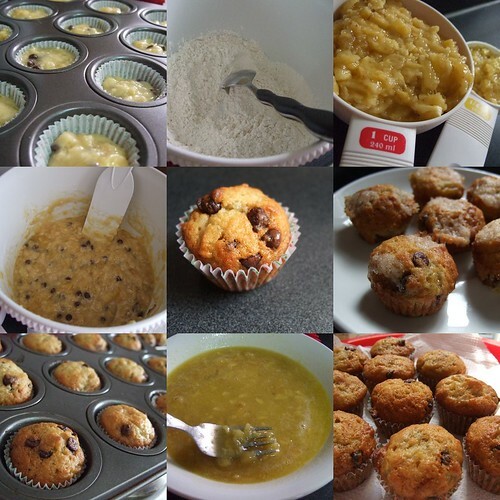 Grease 12 muffin cups or line with muffin papers. 3. Combine bananas, sugar, butter, milk, eggs and vanilla essence in a medium bowl. 4. Mix into dry ingredients until just combined. Do not over-mix! Baking really takes the stress out of school work. Sometimes you got to just step back and leave your work aside for a little while and do something you love. For me, its baking. And of course it’s much more worth the while when I see good friends enjoying this muffin treat. 😀 Here’s Lishan and her muffin, while we were at a field trip on Friday. 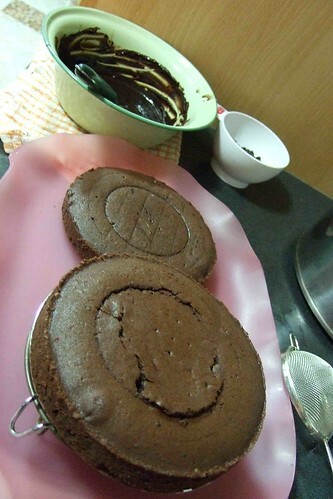 Extremely Rich & Moist Chocolate Cake Recipe. Warning: This recipe is not for any chocolate lover, it is only for those who would die without the existence of chocolate and its goodness. This is one of my favourite chocolate recipes, I hope you will enjoy it as much as I do. Here is the recipe for this luscious cake. I will be posting the icing recipe and display the finished cake, so do look out for it. 1. 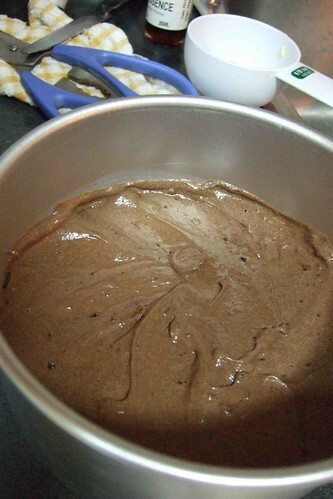 Preheat oven at 175°C, grease and flour 2 cake tins with cocoa powder. 2. Sift flour, cocoa, baking soda and salt into one bowl. 3. 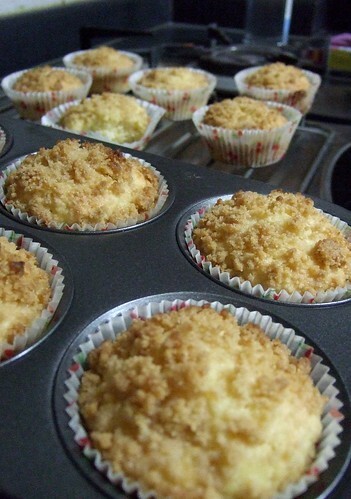 Cream butter and sugar with electronic mixer, until light and fluffy. Beat eggs in very slowly, one by one. Stir in vanilla extract. 4. Combine in flour mixture alternatively with milk, mixing until incorporated. Pour into the 2 cake tins. 5. Bake for 20 to 25 minutes, or when a skewer comes out clean when poked into the middle of the cake. 6. 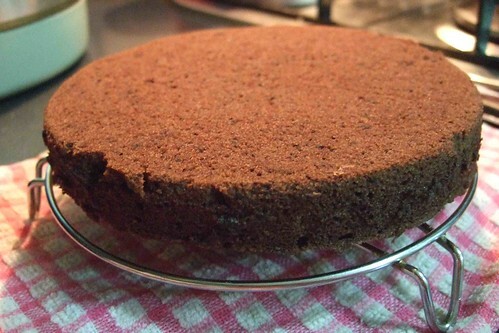 Allow the cake to cool in the cake tin for 10 minutes before removing it to cool completely on a cooling rack. Please note that the oven temperature and baking timing varies across ovens. Results for this cake will depend on the relationship you have with your oven. Here are some photos to guide you along. The cake mixture waiting to be placed into my oven. One layer of the cake cooling off on the cooling rack. The 2 layers waiting to be iced. Watch out for the rest of this post, for the icing recipe and finished cake. Baking and food in Singapore. Hello to the Blogosphere of people who love food and/or baking! I am very interested in getting to know all of you. The purpose of this Blog is to show you what it is like for a 24 year old food and baking enthusiast living in Singapore. I would love to share my recipes and introduce to you all the delicious food that is available here! Trust me when I say that Singaporeans love to eat, it’s in our blood. We claim to be the food capital of Asia. The following video is Singapore from the eyes of Mike Yamashita, who is an award winning photographer for National Geographic Magazine.